Reviews by Students: ratings from students on TripAdvisor, My Language Travel, 123 Teach Me. About Boquete: get to know Panama's eco-adventure capital in the mountains. School's Location and Opening Hours: located in the very center of Boquete close to everything: restaurants, bars, hotels, coffee shops, and just a short walk to the Caldera River and several hiking trails. Building Layout: checkout the school's spatial distribution and get an idea about what you'll find. 7 Classrooms: specially designed to allow maximum interaction between students and teachers and to provide utmost comfort for dynamic Spanish learning. Student's Chillout and TV Area: an area to do your home work or just relax and socialize while enjoying a cup of coffee or using the internet. Habla Ya Spanish School in Boquete is accredited by the Instituto Cervantes, the worldwide authority for teaching Spanish as a foreign language. Habla Ya Boquete is also an Official DELE Examination Center. 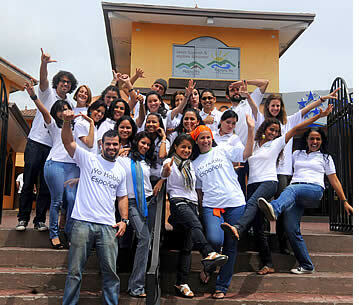 What's it like to study at Habla Ya Boquete? Habla Ya Spanish School is Boquete's most and best reviewed school. Between TripAdvisor, My Language Travel, 123 Teach Me and other online sites, Habla Ya Boquete has more than 350 perfect 5 star reviews. 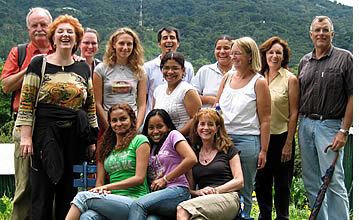 Panama's Eco-Adventure Capital... for all ages! The valley of Boquete is located in the western highlands of Panama at 1,200 meters above sea level in the lush province of Chiriqui. Situated near the Costa Rican border, this enchanted village is nestled in the foothills of the Baru Volcano, amongst the country's most mountainous region. Boquete is Panama's eco-adventure capital... for all ages. Experience unspoiled nature and wildlife: numerous hiking trails in our National Parks, world class whitewater rafting, thrilling zip-lining tours, challenging rock climbing, hundreds of birds such as the treasured Resplendent Quetzal, award winning coffee, relaxing hot springs, scenic horseback riding and so much more... the possibilities are endless. With its modern city infrastructure and small town charm, Boquete is the perfect headquarters to explore the Province of Chiriqui: white sand beaches and turquoise waters are only a 1.5-hour drive away. Return in the evening to Boquete's fresh mountain air and water, breathtaking views, welcoming accommodations and great restaurants. This charming town has harmoniously grown along the Caldera River and is widely recognized for its fertile lands, magnificent natural splendor and year round pleasant weather. Tucked away in Chiriqui's highlands, Boquete is safe, beautiful, inexpensive and exciting and can be easily accessed through 30 minute daily flights from Panama City to David. David is the country's second most important city, and is only 30 minutes away from Boquete by car. Air Panama and Copa Airlines have several flights every day from Panama City to David. 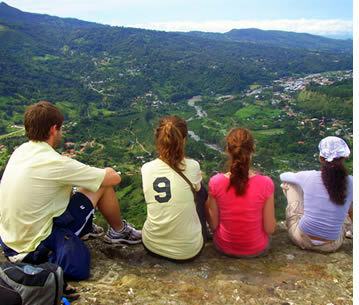 Many visitors also travel to Boquete from Costa Rica. As our student we will guide you to make all the necessary travel arrangements at no extra cost. If you're visiting Boquete, it's impossible to miss us as we're right on the Main Street of downtown. And literally everybody in Boquete knows where Habla Ya is. Just ask! Our Spanish school in Boquete occupies the entire first floor of the front section of Los Establos Plaza, in an area where almost all Boquete's tour operators exist. 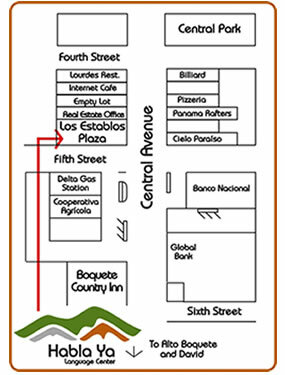 Our building is right on Central Avenue, Boquete's main road, so you'll not have to make a single turn on your journey from David. Habla Ya Boquete Spanish School is conveniently located in the heart of Boquete, only a block from the town's main square and Central Park. We're close to everything, within walking distance to Boquete's finest restaurants, bars, shops and hotels. We'll give you a detailed map of downtown Boquete and surrounding areas that will help you get around. Moving about in Boquete is very easy and almost everything is within walking distance so it is very difficult to get lost. As you may know, Boquete is Panama's ecotourism and adventure capital. 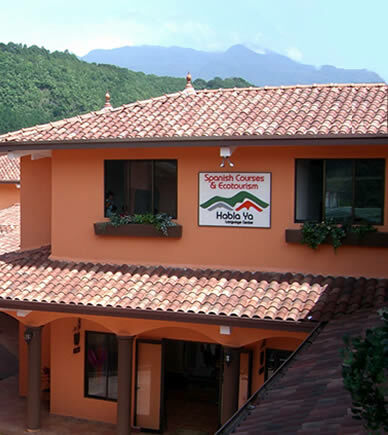 Within our school you can setup every single Boquete excursion and tour that can possibly be done in and around Boquete: be it rafting, hiking the Volcano or Quetzals' Trail, going to the Caldera Hot Springs, Rock Climbing at El Gunko, ziplining, doing a coffee tour, horseback riding or mountain biking... you name, we can make it happen for you!. If you fly from Panama City to David, for only $35 you can take a shuttle from David to Boquete (2 passengers pay a total of $35, and 3 or more $15 each) that will leave you right at our doors. If you make the journey by bus from Panama City to David, you can take a bus to Boquete from the same bus station for $1.75 that will leave you only 1 block away from our school on its last stop. Don't worry: we'll help you make all your travel arrangements. As a student of Habla Ya Spanish Schools you're more than welcome to use our facilities whenever we're open. Monday to Fridays, 8 a.m. - 5:30 p.m.
Sundays, 1 p.m. - 5 p.m.
Our physical address is Los Establos Plaza 20-22, Central Avenue, Boquete, Chriquí, República de Panama. But do not send post to this address because mail in Panama is not delivered to your door as it probably is in your country. We use POST BOXES! And sadly enough the service is slow. If you want to send a package or a letter to anyone at Habla Ya Boquete Spanish School, direct it to: the PERSON'S NAME, Entrega General, #0413, Boquete, Chiriqui, República de Panama. Post to the school should be addressed to Carlos Raúl Cabrera Toledo or Julio Santamaría. Upon entering our Spanish school in Boquete you'll be greeted at our Front Desk area by Giselle (our Customer Experience Director) or Ivan (our School Director's assistant) who always give our students a warm welcoming. At our Front Desk area we take care of our student's accommodation so they'll be able to take you to your host family or direct you to your hostel, hotel or apartment after arriving to our school. Our tours, excursions and get-togethers are organized by our Customer Experience Director but anybody in our reception can help you out so that you enjoy Boquete's ecotourism and adventure tours whenever you want to or just have fun and enjoy the nightlife during the weekend. The Front Desk area is right next to a beautiful staircase that takes you to the upper floor where separate hallways lead you to the east and west wings of our school. One of the nice features of our building is that it has many large windows that offer unspoilt views of the town, plaza, countryside, Boquete's mountains, skies and rainbows. The central gazebo and courtyard at Los Establos Plaza is common to all the establishments and we frequently organize meals and get togethers in this scenic area of the Plaza. Students can as well go outside and read a good book in the Plaza's benches or just close their eyes and get pleasure from the sunshine. 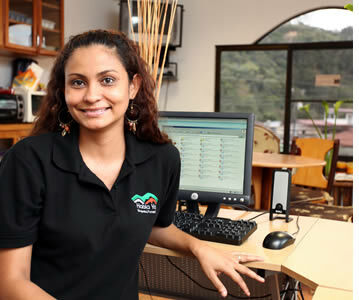 At our Front Desk you'll always find Ivan or Giselle willing to help you out with anything you might need. Their job is to make sure that you're having the most amazing Spanish learning experience! Mitzila or Leidys, in the teacher's area, can also help you out with almost everything. In our teacher's working area your lessons are planned and prepared. Each classroom is adequately illuminated and ventilated to facilitate students concentration for longer periods of time. Tables and chairs are ergonomically designed to ensure everyone's comfort and the furniture is laid out to allow maximum interaction between students and between them and their teacher. The whiteboard can be easily read by everyone in the classroom. Mistral (classroom 1): a large classroom with a rectangular table in which all students sit facing the whiteboard and it also has a nice view to the center of the Plaza. Cervantes (classroom 3): our most spacious classroom can easily accommodate up to 6 students + teacher but as our groups are limited to six students per group this classroom is used when classes will include active dynamics that require students moving around. Students sit around a table with horse-shoe shape and which allows all of them to always have their teacher in front of them. This classroom has a large window with a nice view to the Plaza's front. Márquez (classroom 2): a similar sized classroom as Cervantes but with a rectangular table that allows students to be closer. It is mostly used to motivate conversation within the class and exchange of information between students as all six students are within a close range at all times. Neruda, Miró and Quevedo (classrooms 5, 6 and 7): the first two are a more compact version of Cervantes and the last is a smaller version of Márquez. Borges (classroom 4 in layout): is our private classroom used for couples who requested a Mini Group or for private lessons. Besides having classes at our school, we take our students on strolls to Boquete's most gorgeous gardens and wildlife reserves to have outdoor Spanish lessons in which students get to describe and admire the beauty of nature. In these strolls our language students learn many nouns and adjectives, practice the topics they've been studying in class and get a chance to enjoy the fresh air. Students in our Group 4 Course go on 2 hour strolls every Friday and those in our Crash Course for New Residents go once every 2 weeks. Depending on the group and on the student's level, strolls may take place more than once a week. Transportation and entrance fees for strolls are included within our Spanish course prices. Some of the gardens we visit are El Explorador, Mi Jardín es tu Jardín and Paradise Garden. Strolls also include visits to Boquete's market, the CEFATI, where there are displays and presentations about Boquete's history, Cacique Souvenirs, where our students can admire and purchase Panamanian indigenous artwork and to other places like banks where daily life situations are recreated to help our students really learn Spanish in Boquete. Our common area is a place where our students can do their homework, sit down with their laptop and surf the internet or just take a pause after classes to catch up with teachers and classmates while enjoying a fine cup of coffee (there's a coffee shop just across from us). At Habla Ya Spanish School in Boquete we share a 5 MB internet connection amongst our students. It may not be as fast as what you're used to in your country (20+ MB)... so welcome to the digital divide! If we do not download music, videos or any large files everybody will be able to surf the internet! If you require a larger bandwidth in the internet café down the road you can get higher speeds for $1 per hour or $5 USD per day. The TV & Chill out area is also a recreational area where we have our Traditional Panamanian Dinners on Tuesdays, Movie Nights on Wednesdays and Latin Dance lessons as well as Conversational Sessions on Saturdays. While enjoying its fresh mountain climate and outdoor activities! Contact us!